Discreet yet stylish, the TABORET offers a way to store your assorted odds and ends out of the way but still within reach. 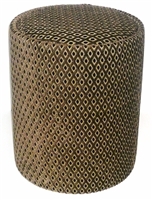 The fully upholstered cylinder features a removable top that opens up to a finished interior perfect for storage. With the removable top that also functions as a cushion for a seat, the TABORET is as functional as it is stylish! Our unique handmade TABORETs will compliment any style you have. Choose one of our many personal touch.